HOW LONG WILL MY TESLA BATTERY LAST? It’s a question that’s on the mind of every electric vehicle buyer: how long is my battery going to last? Yes, in some cases batteries can fail, and in all cases, they lose capacity with age (both mileage and calendar age). Certain factors can cause them to lose capacity faster – extreme heat is one, as some Arizona LEAF owners learned back in 2012. Most EV-makers, including Tesla, warrant their batteries against malfunctions or defects for 8 years. In response to its Arizona embarrassment, Nissan now also warrants its batteries against capacity loss (less than 70%) for 8 years. It’s important to keep in mind the difference between battery malfunction and capacity loss. If your Tesla battery stops working altogether within 8 years (there’s no mileage limitation), the company will repair or replace it. When it comes to the inevitable gradual loss of range however, you’re on your own – as far as we know, no automaker other than Nissan offers any warranty against capacity loss. Fortunately, a new Tesla starts out with plenty of range, so even if you lose 5 or 10 percent after a few years, you should still be able to make your daily commute. But most of us would like to have some idea of what kind of range loss we can expect. If the folks at Tesla have any figures on average capacity loss – and they probably do, considering the masses of data that the vehicles continuously beam back to the mother ship – they aren’t telling. Automakers simply don’t tend to make that kind of information public. Fortunately, Tesla owners have taken the matter into their own hands. Maarten Steinbuch and Merijn Coumans, in cooperation with the Dutch-Belgium Tesla Forum, created a public spreadsheet that allows Tesla drivers to post information about their remaining battery capacity (and you can participate via Google Docs). Users don’t simply enter information every time they charge – rather, they drain the battery to near zero, then charge to 100%. This is theoretically the most accurate way to determine a battery’s true capacity. The project was begun in 2015, so it now has enough entries to show some definite patterns. Ben Sullins, in a recent installment of his Teslanomics podcast, took a deep dive into the data and created a handy interactive chart, which allows you to pick individual cases out of the cluster, to see the results measured by vehicle age or by mileage, and to break the data down by region. So, what’s the answer to the $64,000 (and up) question? Well, apart from a very few outliers (one poor soul was down to 85% capacity after only 32,000 miles – he must have been doing something wrong), the data points clump together quite nicely, and it appears that most users are retaining over 90% of their vehicles’ original range, even after the odometer rolls well into the 6 digits. Plug In America has a similar survey going on, and it has found roughly similar results (though it doesn’t have as many high-mileage vehicles in its database): most drivers are retaining over 90% of original capacity. There are anecdotal accounts of users getting even more impressive results – the shuttle service Tesloop reported back in September that one of its Model S had passed the 200,000-mile mark (in one year! ), and had lost only 6% of its original range (it had also had zero maintenance costs, other than replacing tires and the 12-volt battery). Now, a statistician would tell you that none of this amounts to a true scientific survey. Participants in the Steinbuch and Plug In America projects are self-selected, so they may or may not represent average Tesla owners, and there’s no way to check the accuracy of the data they report. 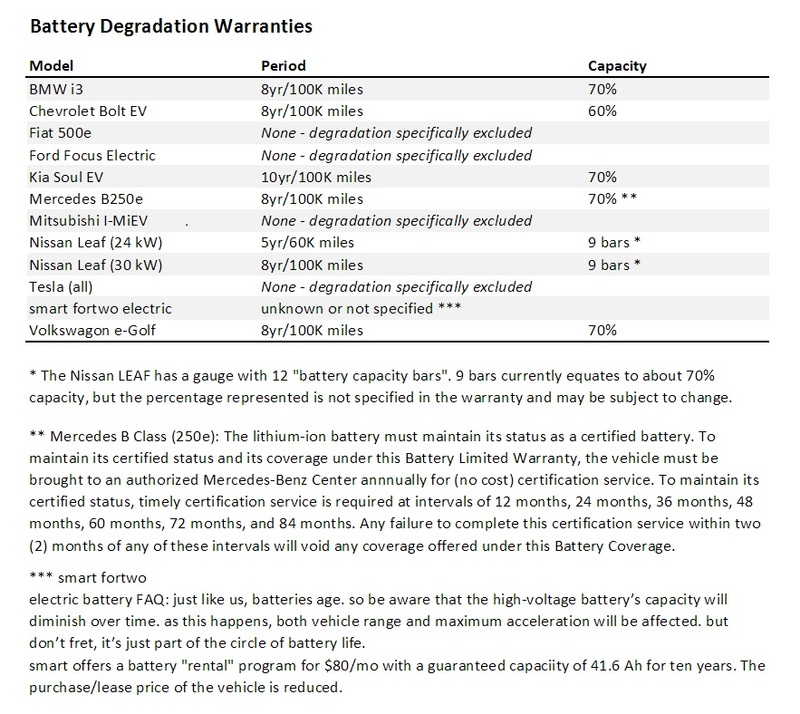 Furthermore, Model S has only been around since 2012, so we have no idea how a 10-year-old battery will hold up. As is true of anything to do with cars (or life, for that matter), your mileage may vary. However, as far as it goes, the data paints a pretty positive picture – battery degradation seems to be a manageable issue, even for high-mileage drivers. And future vehicles’ performance is likely to get even better. We know that Tesla is continually striving to improve its products – the new 2170 battery cell that’s used in Model 3 may well have greater longevity than the 18650 cell on which all this data is based, and Tesla is expected to eventually transition its entire fleet to the newer cell. 78 Comments on "How Long Will A Tesla, LEAF, Or Other EV Battery Last?" It may very well be that most packs will lose more capacity due to calendar life rather than charge cycles, which is a good thing. Nissan’s capacity loss warranty isn’t eight years, its 5 years or 60,000 miles, whichever comes first. You’re dating yourself. That was true of the 24kWh battery only, which is no longer available in new cars. The 30kWh battery is 8 years / 100,000 miles. However, the threshold is 8 capacity bars, not 70%. From what we can tell, that’s closer to 65%, but really it’s whatever Nissan decides it should be. In other words, a very weak warranty. After 25,000 miles, my 2011 Nissan LEAF SL was down to 79% battery capacity. Definitely lost quite a bit of regen, and charging capacity/speed. Look at my chart here. Starting at 20% SOC and 45kW, my charge already starts to taper barely 2 minutes after starting. 75% capacity remaining in my 2011 LEAF after 89,000 miles. Almost no regen makes car worse to drive. Quick charging is now much slower. Not bad. I’m at about 80% on my 2012 Leaf after 42k miles. The lack of regen is a real disappointment. Don’t have the QC port (no CHAdeMOs nearby anyway). Otherwise, it still drives like new. Why would loss of 20% make regen low? I assume you’re able to use DCFC at > 40 kW when it’s below about 50%, I would think you would still have strong regen until then. I couldn’t tell you the technical reason. All I know for certain is that as my battery ages, the available regen gets less and less across all SoCs. I assume that it has to do with Nissan’s software, but could not tell you why they programmed the car that way. You are right, a DCQC will provide more power than the regen (even new, it maxed out at 30kW), and for a much longer time. It doesn’t make sense. If it maxed at 30 kW when new, what is it now after 20% degradation? SparkEV max out 30kW without brakes applied, but about 60kW when brakes are applied. Maybe Leaf without braking get less with more degradation, but just as much with brake applied? Looking at just the max is a little misleading. I can, under ideal conditions, still get close to 30kW. I would guess about 27-28 based on the meter in the car. But what I’ve found is that most situations simply have less regen available. Take an example. Say I am traveling down the highway at 70MPH on a warm (70F) day. I reach my exit, so I start decelerating in ECO (broken out to B mode in 2013+ Leafs). When new, I would easily see 20-25kW of regen. Now I am LUCKY to get 15kW. Usually it’s 10kW until I press on the brake, and then it MAYBE gets to 20kW. Thanks for the info. Wow, 20kW is pretty light. I hope Nissan does something about it, especially since DCFC is far more. There will be lots of used Leaf with some battery degradation coming to used car market, and such light regen isn’t good. I confirm the weaker regeneration as it age. It has never been awesome anyway. Regeneration diminishes because there is less capacity available to charge and aging affect internal resistance. The car still drives great, but the battery…well, not as much as it could be. Regent works by using the battery to store energy when the motor turns into a generator. The battery becomes a resistive load to the generator. If some of the cells in the pack become damaged they are no longer part of the resistive load so there is less load to the generator. The result would be less regen braking. Tesla advantage in there first cars is over 7,000 18650 lithium batteries. If you loose a few, it would be difficult to see a loss of regen braking. I must be one of the lucky ones. My (purchased used at 34,000 miles) 2013 SV now has 47,250 miles on it and still all 12 bars. Obviously it must have lost SOMETHING in range, but it’s nothing that I can notice. I think due to Nissan’s lack of cooling, it probably depends on how you change and discharge. I never fast charge, and basically only deplete it 50% 2x/day: I drive 34 miles to work, charge at 110VAC, drive 34 miles home, charge at 220VAC. Must be helping somehow in terms of mileage per capacity loss. The 2013 battery probably helps too; unsure if it’s a lizard, but so far so good. The airbag sensor failure & windshield wiper pump on the other hand: not impressed. I have found the LEAF is the only big time loser. In over 3 years with the Tesla S 85, FORD Focus EV, Chevy SPARK EV and KIA SOUL EV (2 yrs) we have had zero loss in the Phoenix HEAT where our PHX EAA does it’s real word testing. Drive to work park in the Sun 8+ hours and drive home. I wasn’t aware that is an issue. Thanks to you and Djoni for the info on that. It does seem strange to me that this would have such a large effect on the ability of the car to perform regenerative braking. Obviously there is a limit to how much power the battery pack can either output or absorb, but I would have expected regen to drop due to battery aging no faster than the car’s ability to accelerate. I’d be interested to see if anyone can shed some light on why the ability to perform regenerative braking would drop significantly faster. I have a hypothesis if it’s due to increase in battery internal resistance. If the regen circuit is designed for some fixed peak voltage that would result in about 30 kW regen with new battery’s internal resistance, higher internal resistance would reduce the current. Since the voltage is fixed, lower current would result in lower power (linearly related to R). But DCFC voltage can be varied to keep the current constant, hence able to charge like new, at least to taper point. One could test this hypothesis at DCFC by looking at the voltage of old vs new battery Leaf. If the voltage is much higher on old battery, then battery internal resistance along with too low regen voltage is probably the reason. Question is, do all EV degrade regen as the battery is degraded, or do they have higher voltage regen circuit with feedback loop that compensates for higher battery internal resistance? Intriguing Hypothesis. I have no way to test any of this but would love to see results if anyone can. I doubt the ‘high internal resistance’ is the reason. The roadster, when almost dead, had such high resistance that the air condtioner autonomously started to cool it off. But regen was never a problem at lower state-of-charges. If Nissan had decided to replace your pack, would you have gotten a refurb or a new pack? I am wondering what the people that have seen their early Leafs capacity dip below 65% have seen when Nissan replaced the pack. Any chance those lucky Leaf owners will get a pack with more capacity/AER than the original pack? Used Leafs look like a huge bargain, if there is a way to buy a new/refurb pack at a reasonable price. Someone please tell me why does regen go away or lessen after high miles? Except DCFC power is about the same at least at lower state of charge in one Leaf I saw at DCFC. If battery degradation cause lower power absorption, it should also decrease DCFC power, which it doesn’t. BMW USA warrants the i3 battery pack against more than 70% capacity loss over 8 years or 100,000 miles. What’s going on in that first picture? The Leaf is charging the Model S.
The marketing for the system makes it seem like anyone could carry this around in the rear of his EV on the off chance that he might need to give a boost to a stranded PEV (Plug-in EV), but that’s rather unlikely. It’s a very heavy, bulky system, and I would guess also quite expensive. According to their website, it looks like the target market is EV fleet operators. I’ve seen some 2013 LEAFs for sale that still have 12 capacity bars. That is because they were charged on Level 1 most of the time. Does L2 also degrade the packs like Level 3 charging? Not nearly as bad as those Level 3 Abusers. It’s more about full charge and temperature than L1/2/DCFC. If you charge Leaf in middle of hot summer day using L1/L2 and keep it at 100% (still plugged in) at 100F+ heat, you will degrade the battery more than if you used DCFC in much cooler climate and drove right away to much less than 100%. This is why some Leaf in AZ (few DCFC back then) had severe degradation while those in CA with lots of DCFC did not have as much. Anecdotally, my SparkEV with lots of DCFC use has less degradation than another forum poster who only used L2. I rarely charge to 100% using any form of charging, maybe 5 times in 2 years. SparkEV’s TMS makes ambient temperature moot, so I can guess that it could be charging/storing at 100%. No, cycle count is a poor metric. During testing cycles are typically 90% to 15% and this is relevant, but in use it is better to charge your car every day (don’t wait til it gets to 15%) and don’t charge over 90%. Keeping charge/discharge away from extremes is the best policy. Many shallow cycles is better than fewer deep cycles in terms of battery life. Why is this? My understanding is that all BEVs have a reserve at the top and bottom of the battery, so charging to 100% isn’t really charging to 100%. If that is the case, why is it bad for battery life to charge to 100% (which isn’t really 100%)? I’m asking b/c I’m not en engineer so I don’t have any technical knowledge on the matter, so any light one can shed on this would be greatly appreciated. It’s a trade off. It’s best to keep the charge at some particular level around 50% but then you have no range. The car manufacturer wants to show the highest range possible so they push the limits as much as they can. You’re better off not using all of it unless you really need it. It doesn’t help that the EPA has ruled that if you are given a choice in charging your car the EPA range can’t be the maximum, or at least it couldn’t. I’m not sure if that has changed or not. It’s a rule of thumb. Leaf supposedly has 22 kWh available out of 24 kWh (about 90%). Since “0” won’t be true zero, leaving some margin at low end would mean the top would have to be almost 100%. 2015+ SparkEV is even worse; usable capacity hovers around 95%! Assuming 5% margin on bottom, the battery would charge to 100% when it says it’s 100%. The way I see it, anything beyond about 80% of LiIon is “overcharging” the battery. That’s about the point you transition from constant current charging (constant number of charge carrier movement) to constant voltage charging (forcing few straggling charge carriers). I’m not sure this is correct. Of you do a complete cycle (say 90%-15% as suggested) that is the same as doing 2x half cycles. So you can either cycle 2000 times (in this imaginary example) or 4000 half cycles and that should be the same effect on battery, all things considered. So cycle will be a function of range, eg 10,000mi of full cycles (regardless how those full cycles happen in context of multiple half cycles, quarter cycles,etc) plus age (batteries degrade naturally over time) plus abuse like leaving the car at 100% for extended times, plus abuse like heat. It is pretty complex, but you should clearly see this sort of result from cars that do same shirt of miles each year, in same climate, should have similar battery degradation. Has anyone done that sort of analysis? We bought a late 2013 Leaf S last summer (12k miles), which is now about 19k miles. Still have all bars. Always home charged (mostly Level 2). That shows that 4 years of age doesn’t impact the battery life much. I have not seen any reports indicating that we’ve started to see the effect of calendar life on EV batteries. Keep in mind the oldest production BEVs still in use, the 2008 Tesla Roadster, is still less than 10 years old. I’m sure we’ll start to see signs of calendar life aging eventually, but apparently (knock on wood) the batteries being used today have a shelf life of at least 10 years, and hopefully longer. However, different PEVs (Plug-in EVs) use different battery chemistries, and those chemistries vary from year to year in some cars. So what applies to one model in one year may not apply to another model, or even a different year of the same model. Unfortunately this is a “buying a pig in a poke” situation, and will remain so until EV battery tech matures, which almost certainly won’t happen for many years or likely even decades. We won’t know what the calendar life of batteries in new PEVs is, and once cars are old enough that we’ll have the answer, new cars won’t be using that exact battery chemistry anymore. Similar story here. My 2013 SL had 16k when i bought it, now has over 20k. Rarely charge to 100%. and car is super fun to drive with few, if ANY problems. I walked out of the dealer at $13,000 for everything, and it was a Certified Pre-Owned, so everything has been covered (even the windshield that had some scratches). I’d have even MORE fun with it if my wife wouldn’t stop stealing it and leaving her Volvo keys on the table for me. .
GFO-15-601 and GFO-15-603 are placing DC chargers on most of California highways at least every 70 miles or so. Sure the it would be way too slow for regular travel, but not impossible if you really want it. A Longer range, newer BEV like a Bolt or Tesla would make charging over a 220 mile trip only a minor event. Even an IONIQ would be pretty do-able. Keep a low speed and it would be 1 or 2 charges of 45 minutes each way. But driving ~220 miles in a used leaf would require charging every 50-55 miles or so. I think in general the more longer range and reasonably affordable cars there are the cheaper the lower AER BEVs will be. The Leaf is already so much cheaper in comparison to other BEVs of similar range largely because of issues with the earlier batteries and the bad name they gave the Leaf. While I would suspect other non-Leafs to drop in price when say the Model 3 comes around I don’t personally think the Leaf will drop much because it’s already so darn low. You can usually find 12-bar off-lease Leaf’s for sale for not much more than an 8-9 bar. I personally think it’s probably worth the extra bit up front but that is because I would need the range. If you don’t than it may not be worthwhile. Just know in winter that as Reno gets cold your AER is going to drop a lot so make sure whatever you get can handle that, i.e. don’t expect 80 miles out of a Leaf in winter, or heck even 60 probably and you should be ok.
You’re the first I’ve seen say the second generation Volts are less reliable. The biggest difference between them for me is that the second generation models run on regular gasoline rather than premium. Here, regular has been about $2.30 a gallon lately, and premium about $3.20. Even though I wouldn’t use much fuel, that’s a huge difference. Second generation GM Volts are having some, not a lot, of reliability issues. Many first geneation Volt owners, that have switched to the second generation Volt, have noticed GM has not put as much quality into certain components. Yeah, the 2016 Volts received a “Much Worse than Average” (1/5) rating from the Consumer Reports reliability survey results. 2015s also showed a drop off at “Worse than Average” (2/5), while 2012-2014 all scored “Average” (3/5) which is the minimum score to be considered for “recommended” status by Consumer Reports. I hope Chevy brings up the quality back up rapidly. I wouldn’t own my 2012 Volt if it hadn’t scored Average at least, but reliability is important to me since I always buy my cars several years used. The trick is not to fast charge more than 15 minutes, and not to ever let the battery increase its resting temp. from fast charging by more than 10-15F. Also, try to charge in the early dawn if possible. 3.5 yr old 2015 Leaf. 42k miles, still at 12 bars. I have read on one of these sites that the Leaf will show 12 bars until the battery drops below 85% capacity, so mine is still above that. No range loss that affects usage, as my longest trip is about 62 miles to the DCFC. 3 1/2 year old 2015 Leaf? Is this the year 2018 or am I behind on my calendar or something? I have a 2013 SL Leaf. I lost my 8th bar at 32k mi/3 years. I had only about 6QC (done by the dealership after service). Initially, most of the time it was charged to 80%. Later, I had to fully charge, due to limited range. Arizona heat. The old battery was replaced with a new one. The new one looks better. 88% charge capacity remaining after 70,000 miles in my 2013 Model S. I charge at home on a 240v NEMA 1450 most of the time, although I can just as easily charge on a 120v wall plug. 12 hours of charging on the wall plug gives me 36 miles a day and that is usually more than enough. So even on a wall plug I gain mileage over time. I set my charge limit to 126 daily unless I’m heading out on a road trip. I’m also fortunate to have a supercharger no further away than 90 miles in just about every direction I head. “2013 Model S” is ambiguous! Especially with so many comments here about the Leaf, which has models S, SV and SL. So I’d guess its a Tesla. Really? I guess they don’t know much then. Chevy Bolt has capacity warranty so does the Chevy Volt. It’s too early to see any significant degradation of Tesla model S batteries. When they reach 1000-1500 cycles we will see. There should be enough Leafs that reached 1000 cycles, but the absence of TMS brings too much variation to the data and apparently the Leaf owners aren’t, that enthusiastic about sharing their capacity data. I would like very much to see how the EV battery is dying, and there will be some point beyond which it can’t go, Li-on batteries aren’t immortal. Hmph. It’s also a good way to age your battery prematurely. It would be nice to get additional data, but I think that Plug-in USA has already had some pretty good coverage of the issue, at least for the Tesla Model S (link below). Not sure about coverage of the issue for other plug-in EVs. How long? Probably longer than many a transmission, starter motor, injectors, turbo charger, pistons……et al. I’m curious about the new Prius Prime. The battery is not cooled at all (from what I’m told) not even air cooled. And because it is a small pack it will probably get cycled more often. If the pack manages to hold up, then they have a really great chemistry. Looks like the Prime’s battery is force air-cooled from the passenger cabin air, which presumably will be air conditioned on a hot day. It also has the ability to run the cabin air conditioner and pull that cooled air over the battery during charging in hot weather. Given the smaller battery than the Leaf and the active air cooling I don’t anticipate any problems for the Prime’s battery. Toyota says it is designed to last the life of the car. I do expect the Prime uses a highly advanced battery chemistry and cell construction. They have been tightly partnered with Panasonic for battery tech long before Tesla. Some good advice for all LION battery longevity. I would also like to add that if you are not using your LION batteries for an extended period, like over winter or for a couple weeks, try to store them around 50% charge. This is considered charge neutral and maximizes shelf life. Another good source for maximizing your battery longevity. Also check out the battery university.